Discoveries await in the volumes of Scottish monumental inscription books now available in Special Collections Department. Published in Scotland, these books are rarely available in U.S. libraries. Of the more than 400 titles in the collection, the St. Louis County Library is the only institution listed as owning 250 of them, according to the Online Computer Library Center (OCLC), whose WorldCat database includes the holdings of most U.S. libraries. Monumental inscription books are, as the name suggests, transcriptions of texts inscribed on tombstones and other monuments to the dead, such as memorial plaques, war memorials, and church monuments. While some inscriptions are brief, many offer detailed information. To find a volume dealing with a specific locality, visit the St. Louis County Library’s online catalog and do a keyword search for the words “inscriptions” and “Scotland.” Browse the list, or search by adding a specific place name as a third keyword. 1. Search the library’s online catalog to determine a book of interest. Most books include surname indexes. 2. A lookup request must state the individual’s name and the specific monumental inscription book to search. 3. Patrons may ask for up to three searches per request by written letter or by e-mail to scollections at slcl.org. Emails should include a postal mailing address. 4. If the requested information is found, copies of appropriate pages will be sent by U.S. Post along with an invoice for 15 cents per photocopy plus a $1 processing fee. More info on library research fees. I'd offer to do lookups for people too, but I can't beat the library's prices, and I'm sure they'll do it more quickly than I could. 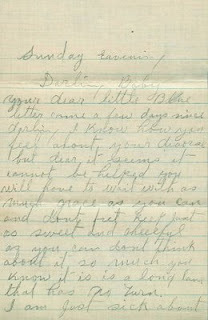 Below is a letter from one of my maternal grandmother's male callers, likely sent in 1919. He was trying to stop my grandmother from marrying a man named Jack. I haven't yet figured out his last name. 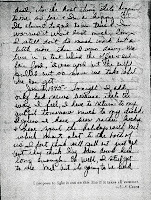 In his letter he provides more information about Jack than either of my grandmother's parents provided in their letters consoling her on her divorce (which I posted last week). I don't think the marriage lasted long. The author of the below letter only signs it "H. May." May is a fairly common surname, and there are several given names beginning with H. H could also reference the individual's middle name or nickname. I have found a couple possibilities in the 1920 census. Again I come as one who is trying to bar your happiness, perhaps; but hope not. Myrtle, I hear you are to be married. Can it be? God forbid it. I admit, by saying that, I hope to benefit myself; but, also, I believe it would be a favor to you. Should you marry that man, it cannot help but make your life a sorrow. Forgive me, Myrtle that I talk thus. Two things there will be to take away your young and just begun happiness. The main one is his disposition that will make it unpleasant and miserable for you. The other is you will leave a home of plenty. Jack already has a family to care for. Another thing, girl, you are his superior. Wait. Go with a few other men. See the difference between this one and others. Then, if you still believe you would be satisfied with his ways go ahead. What future can you look ahead to by marrying him? Only one thing do you know, and that is that he thinks a lot of you. But can that make you happy to be around one who loves as he does? As for being a nice man, there is no comparison between this man and any other in Berclair. But think ahead – of your happiness, etc. Myrtle, if you will not marry yet, and think you could care the least for me, I will promise to do my best that you won’t regret not marrying him. Being I have gone with you but one time, you will perhaps think me a liar, or, as you once before called me – “silly” – when I say that I have fallen in l___ with you. That one night alone, especially, when you shook hands good-night, left in me a feeling for you that I have felt for no other girl. That night, perhaps had no effect upon you other than to want to consider me an intruder and a quarrel maker. If it had no other effect upon you, you will consider this different from how I mean it; then pardon me for what I write. Yet will I ask that you consider me in earnest, and as one who would like to have your love. I wanted to get to talk with you Sat. but had no chance. So have taken this my only chance before it is too late. Will you please write me an answer tomorrow? I will keep it a secret. Your friend – enemy, lover --- or what? PS Excuse lead pencil, bad hand writing, etc. I wrote this late last night expecting to recopy it today, but will not have time before you all with Loyd, my message boy, leaves. Again I say I sure would hate to see you marry that man. Destroy this when you read it, if you do read it. 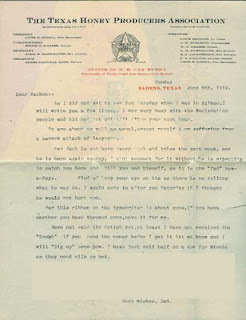 My grandmother didn't listen, to any of his requests, even that of destroying the letter. 'H' mentions Jack's 'disposition', and suggests my grandmother wouldn't want to be around someone who 'loves as he does.' 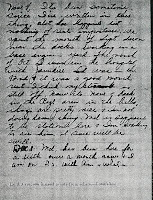 In the letter from Myrtle's father, he expressed concern that Jack might become violent after their divorce. My grandmother moved to St. Louis in the fall of 1920, and I wonder if there was an element of escape involved. Her brother, Sam, was attending college in St. Louis at the time which would have provided a reason for her to choose St. Louis. It appears that Jack was from Berclair, TX, which is about 650 miles from El Paso. However, I do know that Myrtle's father opened a cheese manufactory in Berclair in 1914. And the Van Everys had farms in San Marcos and Caldwell, TX, both within 100 miles of Austin, prior to moving to El Paso, and Berclair is in the same general vicinity, about 140 miles from Austin. The Van Every deed to the land in Fabens/El Paso, TX was purchased in July 1917. I wonder if they could have maintained farms at both locations for a couple years, despite the large distance inbetween. In addition to writing this news story about changing world fashions, Dale Van Every wrote a biography of Charles Lindbergh, several volumes of history on the American Frontier, and the screenplays for the films, Captains Courageous, and Murders in the Rue Morgue (among many). His screenplay for Captains Courageous got him an Oscar nomination in 1938. He was third cousin to my grandmother, Myrtle Van Every. 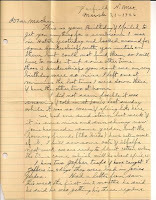 Below are two letters from my maternal great grandparents. They were trying to console my grandmother, Myrtle Van Every, on the end of her first marriage. All signs indicate it was a brief marriage, and all I know is that the guy's name was Jack. Darling Baby your dear little blue letter came a few days since. darling I know how you feel about your divorce but dear it seems it cannot be helped you will have to wait with as much grace as you can and don’t fret keep just as sweet and cheerful as you can. don’t think about it so much you know it is a long lane that has no turn. I am just sick about your dress and just to think I am to blame. I am heartly sorry but that don’t buy you a new dress. dear I had a real good time while I was with you what better did I want than to look forward to my baby coming in and being with her the rest of the evening and besides I had such a good rest I feel like coming back. As I did not get to see you Tuesday when I was in El Paso, I will write you a few lines. I was very busy with the Reclamation people and did not get out until after your noon hour. We are about as well as usual, except myself I am suffering from a severe attack of lazyness. Say Jack is out here every week and twice the past week, and he is here again to-day, I can’t account for it without he is expecting to catch you here and kill you and himself, as it is the “fad” now-a-days. Kind of keep your eye on him as there is no telling what he may do. I would come in after you Saturday if I thought he would not hurt you. Say this ribbon on the typewriter is about gone, if you have another you have throwed away, save it for me. Have not sold the cotton yet, at least I have not received the “dough.” If you need the money before I got it let me know and I will “dig up” some how. I have just paid half on a cow for Minnie as they need milk so bad. image above was edited as I decided not to share the entire letter. I'm guessing the 'five dollars raise' referred to a job Myrtle had before getting a job with the QuarterMasterCorps in El Paso. She began her job at the QMC in August of 1919, and I have a record of her career after that. I hope my great grandfather was exaggerating, or at least not being literal, when he talked about Jack's potential for violence. Next week: A letter from one of Myrtle's male friends, before she married Jack, trying to stop the wedding with a proposal of his own. Unfortunately, he didn't sign his full name, nor did he put a date on it. Randy at Geneamusings provides his weekly Saturday Night Fun challenge. This week it was to map the patrilineal line of your paternal grandmother, with Y-DNA tests in mind. * What was your father's mother's maiden name? * What was your father's mother's father's name? * What is your father's mother's father's patrilineal line? That is, his father's father's father's ... back to the most distant male ancestor in that line? Herman’s father was Selig Dudelsack (who changed his surname upon coming to America), and his father was Samuel Zvi Dudelsack. * Can you identify male sibling(s) of your father's mother, and any living male descendants from those male sibling(s)? If so, you have a candidate to do a Y-DNA test on that patrilineal line. If not, you may have to find male siblings, and their descendants, of the next generation back, or even further. My grandmother had two brothers. One brother had a daughter, the other brother had a daughter and a son. That son had a daughter and two sons. So there are some living male Feinstein-Dudelsacks who could have a Y-DNA test. Selig had two male siblings. One, Gershon, remained in Poland. I have no idea what happened to that branch of Dudelsacks. The other, Yidel, came to America and changed his name to Julius Odelson. Julius’s son Samuel had 13 children, including ten sons. (Eight of whom served in WWII and were featured in a newsreel.) There are also some male Odelson-Dudelsacks available for a Y-DNA test. One that could prove scientifically that our branches are related. If there were interest from both the Feinstein and Odelson branches, I might encourage it. Otherwise, it's not very important to me to find out which haplogroup each of my lines came from. Especially on my father's side where I expect them to be geographically similar. There can always be surprises, but I'm more interested in my maternal lineage DNA since I know there is more diversity there. My mother sent an mtDNA test in a week or so ago, and perhaps we will be told that she belongs to haplogroups A,B,C,D or X which are the known Native American ones. 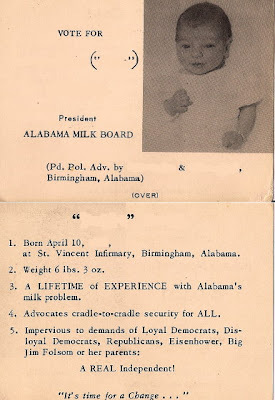 I have found several creative birth announcements in my grandparents' collections, and below is one of my favorites, with the identifying information carefully edited out to protect the innocent. The final pun-ch line elicits a serious groan every time I read it. On the front of the index card announcement there was the child's name. (The name within the quotes was the same as the middle name, indicating the parents from day one intended to call the child by their middle name. A Google search indicates that their wishes held, and the child still uses their middle name.) At the bottom were the names of both parents - using the mother's maiden name. On the back of the announcement the name appeared again, with the birth date. Both child and mother were new records in my database, so the announcement proved helpful in addition to providing some laughter. The political references narrow down the time period, but I decided to remove the exact year as an additional precaution, as this individual is still relatively young. It's March 17th again, so it's time to pay a tribute to my great-grandfather, Barnet "Barney" Newmark. My Hebrew name, בָּרוּ (Baruch), was in his honor. He celebrated his birthday on March 17th, and claimed to have been born in Dublin, Ireland. However, the Newmark family actually came from Warka, Poland (37 miles south of Warsaw.) It was only a minor fib, as this map illustrates. In a way, I owe my recent obsession with genealogy to my great grandfather's fib. It made for a fun story to tell my friends on the holiday, and one of those friends was also obsessed with genealogy, so he conducted a search, and sent me a link to the 1920 HeritageQuest census for my great grandfather. Once I realized what was available online, there was no turning back. That was two years ago, in April of 2007. 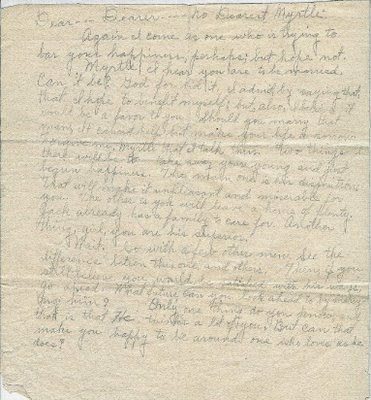 The following letter was written by Melvin Van Every to his daughter Myrtle (my grandmother) on her 26th birthday, March 21, 1926. He lived in Garfield New Mexico, just across the border from El Paso, TX. She had been living in St. Louis for 5 years. All of his letters to her began with "Dear Machen", likely a term of endearment meaning either 'little girl' or 'little woman'. Minnie and Sam are a sister and brother of Myrtle's. Josie was Melvin's second wife. This is your Birthday and I failed to get you anything for a remembrance. I was in Hatch yesterday and looked around for some handkerchiefs with your initials on them but could not find them so I will have to make it up some other time. Those 3 handkerchiefs you sent me on my birthday were so nice. I left one at Minnie's the last time I were down there and have the other two at home. It did not seem possible it was snowing and cold in St. Louis last Sunday while it was so warm and springlike here. We had one sandstorm last week and it is sure nice and sun shiny now. Josie has made some garden but the farmer's friends (the birds) have eaten most of it. I will sow some oats and alfalfa next week. We are ready to plant cotton when the time comes which will be about April 15. I have two gopher traps and have caught 8 gophers in 4 days. They were bad in Josie's garden. Had a letter from Sam this week. The first in 2 months. He said he was getting his three regulars. Well write me a long letter & just tell me anything. 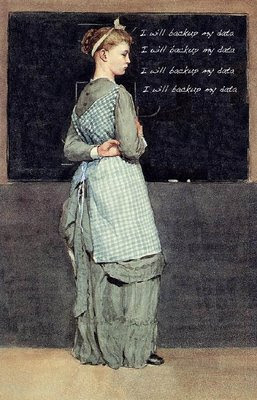 The month of March being National Women's History Month, and March 8th having been International Women's Day, the topic for this edition of the Carnival of Genealogy is: A Tribute to Women. Write a tribute to a woman on your family tree, a friend, a neighbor, or a historical female figure who has done something to impact your life. Or instead of writing, consider sharing a photo biography of one woman's life. Or create a scrapbook page dedicated to a woman you'd like to honor. 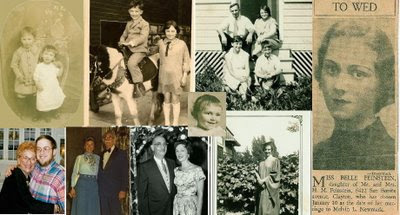 At the top of the collage we see Belle with her older brother, Benny, her younger brother, Seymour, and her parents Herman and Annie. Benny gave both of his siblings nicknames that stuck with them for the rest of their life - Sissie and Babe. In the bottom row we see photos from her high school graduation, Sissie and her husband, Mel, and on the far left, a photo with her grandson, John (me), taken in 1995. Obviously, on the far right, is a newspaper clipping announcing her engagement. However, unbeknownst to either set of parents, she and her fiancee were unable to wait until January 10th, and were actually married on May 10th the previous year, in a small town in Illinois, where their names wouldn't appear in the local paper. There were two marriages, with two marriage certificates, 8 months apart. I think I know the very first book I borrowed from her and Grandpa's library. I don't remember when it was, but I saw it a couple months ago, and borrowed it again to re-read. The Education of H*Y*M*A*N K*A*P*L*A*N.
Thursday nights might be the most difficult for me. For years Thursday night has meant dinner with Grandma, and watching Seinfeld, Friends and Will and Grace. Were these her favorite television shows because her grandkids watched them with her, or did her grandchildren watch them with her because they were her favorite television shows? Maybe a little bit of both. I Love you Grandma, and always will. Shachna Itzik Birger (aka Charlie Birger) was born on February 5, 1881 in Lithuania. His family arrived in Glen Carbon, IL (near East St. Louis) when he was about 8 years old. After a stint in the army from 1901-1904, he returned to Illinois and became a miner and a saloon keeper. When Prohibition happened, he became a bootlegger in Southern Illinois. As a bootlegger, one of his largest rivals was the local branch of the KKK, which actively supported prohibition, viewing alcohol as an evil allegedly introduced to the US by immigrants. Birger’s gang, and a rival gang, The Shelton Brothers, managed to run the KKK out of town. After this success, though, the two gangs fought over who would control the bootlegging in the area. 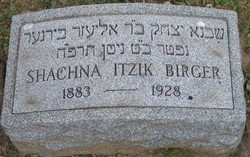 Shachna Itzik Birger is buried at Chesed Shel Emeth Cemetery, in Section 28, 5th row, 3rd grave. 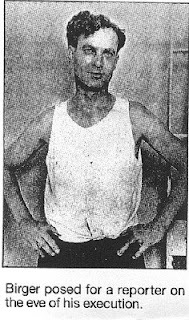 "The Hanging of Charles Birger"
His boldness did not save him when the law said, "You must hang." Then the cry of justice said, "The murderers must be found!" Way out west in Benton, Charlie Birger met his fate. Another man has gambled in the game that can't be won. Last July it became popular to create wordles from the words on your blog. That is, create a graphic representation of the words, so that the more often the word was used, the larger it appeared in the graphic. Wordle.net allows you to input text instead of a URL, so I'm sure some geneablogger back then thought of exporting the surnames in their database, but that idea occurred to me last night. In my database software, iFamilyForLeopard, I selected 'Index' under the People menu, and selected the option to generate a CSV file. I was then provided a list of data names, and I selected only 'family name'. The excel sheet that was generated was one long column that was easy to copy and paste into the wordle.net text box. This image shows some of the more common collateral surnames in my database that my surname entry doesn't include. There was a significant difference in ages. Melvin was born in 1912, Harold in 1915, and Mandell in 1923. 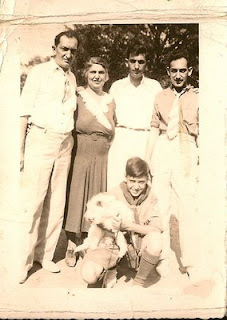 Here we see them, along with their parents, when Mandell was likely in his early teens. When Mandell was in his late teens, his brothers would invite Mandell to bring his girlfriend to their homes for dinner. Then the war came. Mandell was 20 years old when he enlisted in 1943. He was killed in action on April 15, 1945. In October of 1944 he spent a month in the hospital due to jaundice, and November and December he was allowed to spend in reduced service with his brother, Mel, who was stationed nearby. 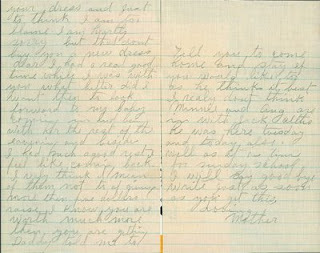 He wrote in his war diary about how grateful he was for that month, and how he was disappointed to see it end. 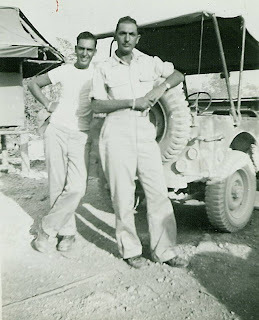 Below is a photo of Mandell and Mel taken in December of 1944 on the island of Biak off the coast of New Guinea. Fate took the lives of their parents and five other siblings, leaving them with each other. 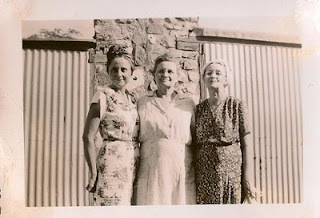 The photograph below was taken in 1947, when Myrtle took her two daughters to Texas to visit their aunts and cousins. Celebrate Your Name Week is a holiday created in 1997 by American amateur onomatologist Jerry Hill. Hill declared the first full week in March a week for everyone in the world to embrace and celebrate his or her name, and to appreciate names in general, by having fun getting to know facts about names. This is a week set aside to participate in names-related hobbies, activities, and to take part in entertaining names-related events inspired by a fondness for and true appreciation of names. John comes from the Hebrew Yochanan, meaning 'G-d is gracious.' It isn’t short, as some assume, for Jonathan. Jonathan comes from the Hebrew Yanatan, which means 'Gift from G-d,' and is a longer form of Nat(h)an. My Hebrew name: בָּרוּ (Baruch). Baruch is a Hebrew word meaning, “Blessed.” Benedict is the common English version of this name. My parents chose “Baruch” naming me after my great grandfather, Barnet "Barney" Newmark (1886-1956). 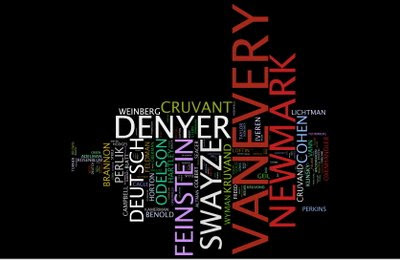 Cruvant is one of my ancestral surnames, the maiden name of my paternal great grandmother Bertha Cruvant Newmark (1887-1978; She and Barney were married in 1911.) Since my parents followed the tradition of choosing names from deceased ancestors, my middle name came from Bertha’s father, Moshe Leyb Cruvant. The origin of Cruvant is the town Kruvandai, Lithuania. The origin of our surname isn’t certain. It is thought that the surname was Neimark (or Nejmark) in Poland. There are multiple Newmark “clans” in the United States, and it is uncertain whether they are related, though several appear to have originated in Poland, and several made stops along the way in Great Britain. I am unsure of the family origins of the British Member of Parliament, Brooks Newmark, or the British celebrity chef, Rex Newmark. I share the name “John Newmark” with a Canadian pianist (1904-1991) - Though he came from Germany, and his original surname was Neumark. I also share my name with the British biologist, and identical twin who appeared on the television show, To Tell the Truth, with his brother, George. This is what Amanuensis Monday was created for. Amanuensis is an obscure word, but it derives from the Latin, ‘Manu’ meaning ‘hand’. The GeneaBloggers group on Facebook hosts a monthly Data Backup Day on the first of every month. It's a very good idea. If I worked off a desktop Mac, I would plug in my external 250gb Hard Drive, set up Mac's Time Machine. And then forget about it. The software would take care of itself, every hour making an incremental backup of any and all changes, allowing me to go back into time a hour, day, week or month to see what my computer looked like then. I've seen it at work flawlessly on my parents' computer. When your mobile Mac is connected to your backup drive, Time Machine works as you’d expect. When it isn’t connected, Time Machine also works as you’d expect. It keeps track of which files have changed since the last backup and backs them up to your backup drive the next time you connect. So the backups aren't hourly or daily - they're only when I remember to connect the drive. I'm sure I will be able to remember to connect to the external hard drive at least once a week. So my first activity for this month's Data Backup Day was setting up Time Machine. But there are other backup issues. How does one backup one's blog? With Blogger it is easy. Click on Settings, and at the very top of the Basic Settings page is a link to 'export your blog'. The blog is exported in an xml format. How large will the file be? My entire history of blog posts here was 2.3 mb. Exported and saved on to my hard drive, Time Machine will backup this file with the rest. I could export my genealogy software data into a gedcom file monthly - I have done this in the past - but I don't really have to with Time Machine - as it will back up the data file native to the software on its own. I feel much more safe now than I have in the past. I have suffered a handful of computer crashes where I have lost files I thought I had backed up, but I hadn't.